FLY, the soaring tale of the first African American Army Air Corp pilots known as the Tuskegee Airmen, returns in April to Crossroads Theatre Company where it premiered seven years ago, culminating a bicoastal tour of the critically acclaimed production. Fly will be on stage at Crossroads April 7 through April 17. Performances are April 7, 8, 9, 14, 15 and 16 at 8 p.m.; April 10, 16 and 17 at 3 p.m., and April 13 at 10 a.m. The Crossroads run will complete a bi-coastal tour for the current production, which is co-produced by Crossroads Theatre Company and the Pasadena Playhouse. It opened in late January in Pasadena and moved to the New Victory Theater in New York for its off-Broadway premiere March 11-27. Co-written by Crossroads’ co-founder and former artistic director Ricardo Khan and author and educator Trey Ellis, Fly was first commissioned in 2005 by the Lincoln Center Institute, the educational arm of Lincoln Center, where Khan was an artist-in-residence. An early 1-hour version was performed there. The final version had its world premiere at Crossroads in 2009 to critical acclaim. It has since been produced at Ford’s Theatre in Washington, D.C., and other regional theaters. Khan directs the production, which is choreographed by Hope Clarke, who has had a long association with Crossroads. The cast features Brooks Brantly, Ross Cowan, Omar Edwards, Anthony J. Goes, Brandon Nagle, Desmond Newson, Damian Thompson and Terrell Wheeler. 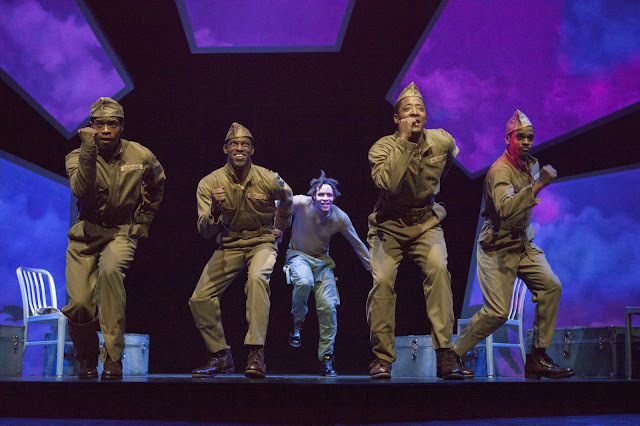 The creative team for Fly includes set designer Beowulf Boritt, costumes by Toni-Leslie James, lighting design by Rui Rita; sound by John Gromada, video/projections by Clint Allen and improvography by Omar Edwards. Also known as the “Red Tail Black Eagles,” the Tuskegee Airmen were named for Tuskegee, Ala., where they earned their wings at flight school. Their story is told through four characters from different parts of the country, including one originally from the West Indies, who are representative of the men who went through training. This year marks the 75th anniversary of the Tuskegee program, which officially began June 1941 with the 99th Pursuit Squadron at Tuskegee University. 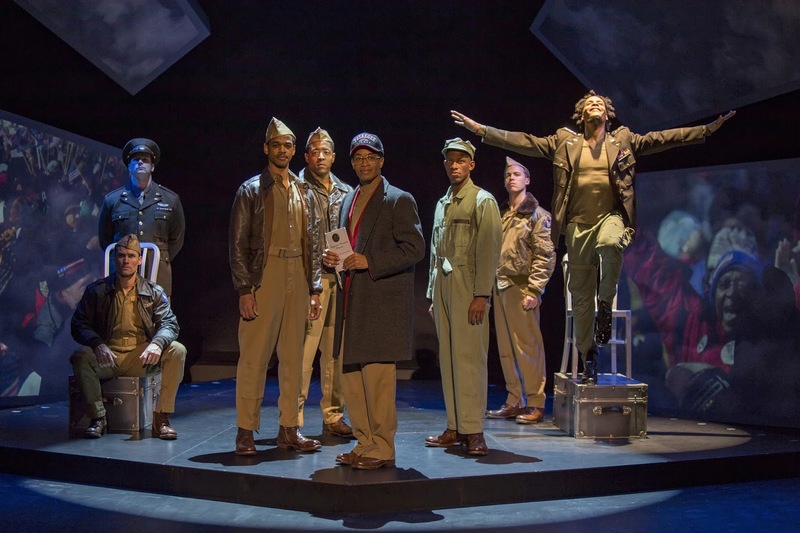 Also present in the play are their white instructors and white fellow pilots, who question whether black men can succeed as military pilots, a notion that was prevalent in the country, and a barrier the airmen faced and ultimately conquered. 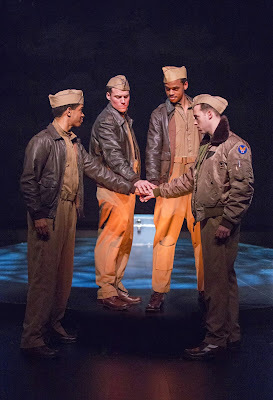 Fly is told in flashbacks by one of the black airmen on the day Barack Obama is inaugurated as president of the United States. The movement and sounds of Tap Griot (Omar Edwards) accentuate the drama, lending suspense and emotion to the action. Tickets to Fly are $25 for the Wednesday matinee and $45 for all other performances, except opening night on April 9, when they are $55. To order tickets, call the theater at (732) 545-8100 or go online to crossroadstheatrecompany.org.